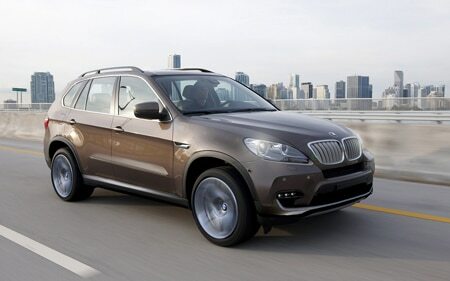 At the 2014 Detroit Auto Show, BMW is expected to release the third iteration of the popular X5. Six months later, the new X6 is scheduled to see the light. Both models are based on a new components set known in-house as “X for all,” a result of BMW’s growing interest and expertise in all-wheel drive. For the X5 and X6, “X for all” means new axles derived from the 5-series sedan. They will, according to BMW, help reduce the weight by up to 330-pounds. As a result, the lightest X5 replacement is said to undercut the two-ton mark by a small yet significant margin. An unfortunate victim of this new design is the X6’s torque-vectoring rear differential, which works magically but adds weight and cost. Instead, BMW intends to offer the optional active steering, a self-leveling air suspension and Adaptive Drive, which employs adjustable anti-roll bars to suppress unwanted body movements. The three-way damper calibration system (normal, sport, comfort) and the related engine/transmission control are expected to be no-cost parts of the X5/X6 parcel. The two crossovers also introduce an array of driver assistance devices that likely preview what’s to come on the next 3-series. Among them are lane departure warning and compensation devices, night vision, park assist with surround view cameras, traffic sign recognition and active cruise control that allows the vehicle to come to a complete stop and accelerate up to speed. All-new styling for the X5 likely refrains from the swoopy swooshiness of Adrian van Hooydonk’s most recent creations like the 6-series coupe. The cabin layout is said to be remarkably close to the 5-series Gran Turismo, which is doing extremely well in China. Expect extras like a full-length glass sunroof, power-operated rear seats, and a much more practical split tailgate with a lower section that folds up rather than down. A sports package includes larger wheels and a more ground-hugging stance, as well as an aero kit that reduces drag and increases down force at speed. Although the X6 styling still won’t be an object lesson in functional design, the coupe crossover does get a dose of practicality. A redesigned (and better looking) stern improves visibility and creates quantifiably more rear headroom. Wider rear doors ease entry and exit. That said, the pseudo SUV also gets an even more dynamic looking greenhouse. New front and rear fascias round out the update. The Xs will once again benefit from a full M division treatment. The next X5 M and X6 M retain the twin-turbo 4.4-liter V-8, which increases in performance from 555 to 565 hp. More important is the 10 to 15 percent gain in efficiency. At the other end of the scale, we find two new four-cylinder units, which are tipped to debut in the next X5/X6. A 2.0-liter diesel develops 245 hp and 260 lb-ft, while a 2.0-liter gas-fed four Europeans know from the X1 is good for 245bhp and 260 lb-ft (the U.S. market has not seen the X1 yet because BMW can barely meet current demand). Perhaps the most exciting engine BMW has up its sleeve, though, will be the twin-turbo diesel shoehorned into the X5/X6 50d. The high-performance oil-burning straight-six develops some 405 hp – enough to humble any diesel-powered V-8. Alas, it may not reach the U.S. market. Also earmarked for 2014 are plug-in hybrid variants of X5 and X6. It features a 110 hp electric motor housed into a ZF nine-speed automatic, and will initially be paired with a 350-hp inline-six. A diesel-electric hybrid may follow unless a rethink of European emissions regulations favors the gas engine. Looking beyond the X5 and X6, BMW is likely to expand its all-wheel-drive lineup even further. Arriving as soon as 2012 is the all-new X3 M. While the bigger brethren share their engine with the M5, the X3 M uses a tweaked variant of the new M3 motor. Provisionally rated at 450 hp, the high-performance straight six may feature three turbochargers (one electric, plus a pair of exhaust-gas driven ones) and a slightly bigger displacement (3.2 instead of 3.0litres). The Bavarians are also thinking about a long-wheelbase X7 based on the X5/X6 platform. Codenamed F17, this stately seven-seater would take on the equally tentative Audi Q9 and the follow-up to the Mercedes-Benz GL. Trouble is, full-size crossovers are not exactly the flavor of the month anymore, and they don’t look good on the CO2 balance sheet either. Just about the only way to make these big soft-roaders socially acceptable is by switching to an aluminum space frame architecture, which presently neither BMW nor Mercedes can muster, especially since these vehicles only appeal in three markets – China, Russia, and the United States. At the other end of the spectrum, BMW will incorporate all-wheel drive into the platform it’s developing for the next generation MINI Cooper and 1-series.